What's the Difference between Miu Miu and Prada? Prada and Miu Miu frames, along with over 100 brands, are currently 40% off at FramesDirect.com! Check out the full list of participating designers here. Since both brands fall under the same umbrella, many wonder: what is the difference between Miu Miu and Prada? Aside from the fact that both spring from the mind of fashion mastermind Miucci Prada, Miu Miu and Prada have very little in common. They come from entirely different schools of thought when it comes to design. "Designing for me is a very complex process. There are many ideas that I want to express in one object, very often contradictory. The creative process in Miu Miu is completely different from that of Prada. Rather than being young, Miu Miu is immediate. Prada is very sophisticated and considered; Miu Miu is much more naïve. The solution, when I am working on Miu Miu, has to come immediately, instinctively, spontaneously with whatever is available at the moment. If I think three times, I stop." In other words, the difference between Prada and Miu Miu is the difference between a stand up routine and improv. The difference between a flight you booked a month ago and a drive to the beach you decided on five minutes ago. The difference between Instagram and SnapChat. It's the difference between an opera that took years to write, and a brilliant idea that sprang into your head without warning (it's happened: J.K. Rowling said that the character of Harry Potter jumped into her mind while she was riding a train). You can see this philosophy reflected in their eyewear as well. Look through their catalogs and you'll see bold, risk-taking, artful flourishes in the Miu Mius. Had they gone through a design committee, some of the more eccentric touches may have been edited out. As they stand, they have a pure, impulsive and exuberant feel. The Pradas, meanwhile, are more thoughtful and deliberate: carefully constructed with a softer aesthetic. Not quite as shocking, but just as stunning. Here's some examples of both Prada and Miu Miu glasses so you can see for yourself. Both totally different approaches for different tastes. We can see a big difference between Miu Miu and Prada. Which one do you prefer? And don't forget: all these frames are 40% off at FramesDirect! 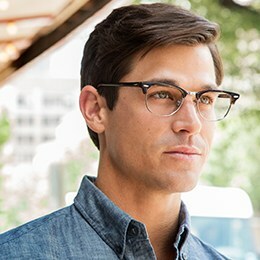 Prescription lenses are also 50% off. FramesDirect.com > Blog > What's the Difference between Miu Miu and Prada?